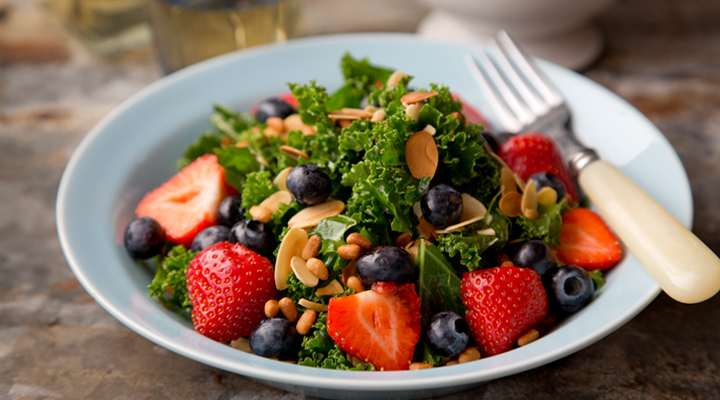 Kale and blueberries are most commonly associated with summer and autumn, but if you’re looking for a highly nutritious meal to get you feeling good after a few days of indulgence, then this salad is a great option no matter what time of year it is. 1. Toast the almonds and pine nuts in a hot dry pan for a few minutes, tossing regularly. Once they begin to brown, tip them out onto a plate. 2. Place the kale in a salad bowl, drizzle over the oil and massage it into the leaves. Add the lime juice and a pinch of salt and pepper and toss to coat the leaves with the juice and seasoning. Top with the blueberries, strawberries and nuts and serve straight away. Tip: If you want to boost the protein content of this salad, simply add some leftover roast chicken.